This question often comes up whenever someone buys their first Mosquito. How do I get the mast up? The Mosquito mast is very easy to put up, as it is very light for a cat mast and, being a cat, it is possible to walk right up to the front beam where the mast stands. This method only requires one person of any build and can be done in any conditions (even when you shouldn't be thinking of sailing at all!). Step-by-step here it is. If you are lucky enough to have a hinge plate on the base of your mast you can pin it to the mast step now. The hinge must be in front of the mast so the mast can go up from in front of the boat. The photo to the right shows what I mean by a hinge plate. 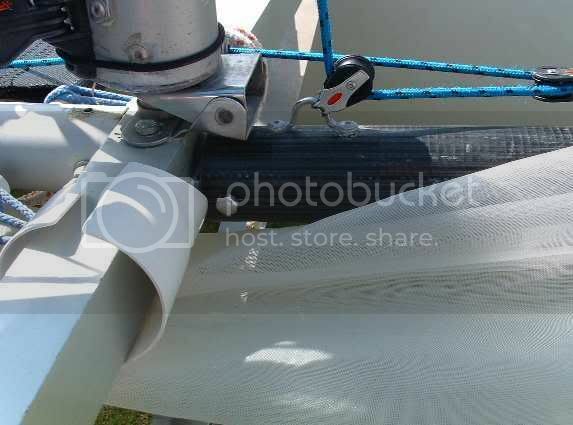 This photo shows the mast up and the pin removed - the pin must always be removed while sailing. If you don't have a hinge plate do not despair. An eyelet on the front of the mast can be used to tie the base of the mast to the dolphin striker. This will do the job. Just make sure there is enough slack to allow the mast to stand up. Attach the stays and trapeze wires to the mast. Tie the trapeze loops to the ends of the main beam using the downhaul control line ends. If there is nothing on the ends of your main beam to tie to, then just drill a hole in each end of the main beam, big enough to get the downhaul rope through. Loosely attach the stays to the same spot with the end of the downhaul ropes just to stop them swinging around and tangling when the mast goes up. Attach the bridle and tie the forestay on loosely. By loosely I mean about a whole 200-300mm looser than where it would normally be set. Now you should be able to place the pin on the base of the mast so it is just resting on the main beam and most of the slack will be out of the trapeze wires (you will soon work out the right adjustment for tying the trapeze loops to the beam for your boat). Pick up the mast at the hounds and make sure the stays and trapeze wires are all hanging correctly without twists or tangles. Now walk your way to the foot of the mast till it is upright and then lift it and stand the mast pin in the mast step (if you have a hinge plate the pin will automatically end up in the mast step - luxury!). Now let the mast lay back on the loose forestay. The mast will happily stand there while you attach the sidestays. Once the sidestays are on take all the slack out of the forestay and tie it off. Your mast is up.